Synergy Global Housing is awarded the 2015 Service Award for SIRVA Suppliers for exceeding customer service expectations at 4th annual suppliers summit. 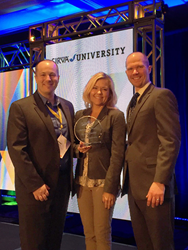 Synergy's Peter Meyers and Amy Ramskill receive the 2015 Service Award for SIRVA Suppliers from SIRVA’s John Kaiser during this year's SIRVA University conference. Synergy Global Housing announces that the company has been awarded the 2015 Service Award for SIRVA Suppliers during the 4th Annual SIRVA University and Suppliers Summit held in Laguna Niguel, California on March 7-9, 2016. The Service Award for SIRVA Suppliers is given to the partner who exceeds SIRVA and its clients’ service expectations. Synergy was noted for surpassing SIRVA’s stringent expectations for overall quality through its responsiveness and customer-centric communication. Additionally, Synergy was recognized for being a top performer among all suppliers and improving the overall score for the SIRVA customer supply chain. The award was received on behalf of Synergy by Amy Ramskill, Director of Business Development. In addition to receiving the Quality Award, Synergy also participated in SIRVA’s social responsibility event. Attendees partnered with the Second Harvest Food Bank of Orange County to sort and package food items to nearly 350 member agencies, who will distribute the food packages to 200,000 hungry people in the county. Synergy Global Housing brings a superior furnished housing experience to the relocation, project management, business travel, and other global mobility industries; providing best-in-class serviced accommodations in more than 50 countries across the globe. Synergy has Global Solutions Centers in: Dublin, Ireland, Hyderabad, India, Singapore and San Ramon, San Francisco, Los Angeles, San Diego and Orange County, California. Through people, passion and innovation, Synergy delivers boutique services, custom-tailored to meet each client’s individual needs, on a worldwide platform.